The Pleasant Valley Country Store will be open November 3rd - December 23rd 2018. 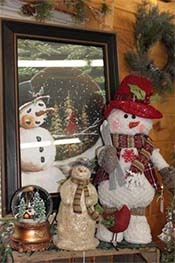 The store is brimming with unique gifts for everyone, many with a casual or upscale country and lodge theme. The glorious colors and gifts of Christmas are always on display - Nativity sets, Santas, snowmen and florals. Are you looking for a special ornament? We have 1000's of ornaments available. Select from vintage glass, snowmen, sports, outdoor, animals, birds, Santas, Nativity and angels. Create a wonderful gift basket with festive linens, scented candles and delicious gourmet foods or decorate your home with beautful framed prints. We have the perfect gift for everyone on your list (including yourself)! November is the start of our Christmas season. Visit our Christmas Open House on Saturday, November 17th and Sunday, November 18th. Pleasant Valley is brimming with unique merchandise and beautiful real evergreen wreaths. We offer fresh balsam and fraser fir wreaths handmade at our farm. Our wreaths are individually decorated with designer ribbons, pinecones and coordinated berries or picks. Come to our farm and choose from hundreds of beautiful, fresh evergreen wreaths. Our wreaths are made daily for optimal freshness. To learn more, call us at 715-879-517 contact us on our website.